A writer/poet from the tourist town of Sagada in Mt. 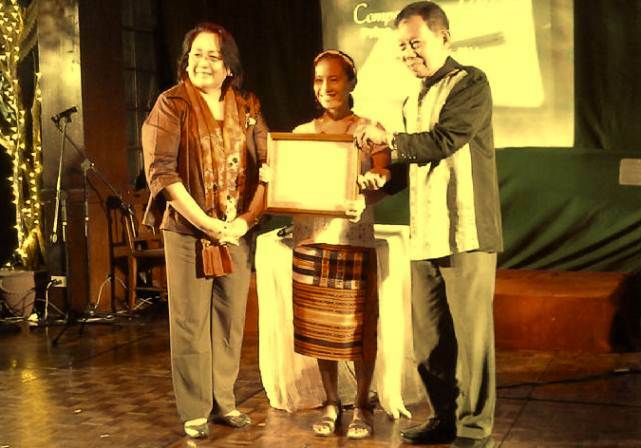 Province was announced as the winner in the Poetry: Kankana-ey Language category of the NCCA Writers' Prize. Gawani Domogo Gaongen earned the recognition for Sukat, a collection of poems penned in the Kankana-ey language. Gaongen received the certificate of recognition from Felipe M. De Leon Jr. (Chairman of the National Commission for Culture and the Arts) and Christine Godinez Ortega (Chairman of the NCCA's National Committee on Literary Arts) during an event recently held at Barbara's Heritage Restaurant in Intramuros, Manila. Gaongen received the certificate wearing the traditional Igorot attire. Gaongen is one of three winners announced by the NCCA. The other two winners are Estelito Jacob in the Novel: Rinconada Language category and Ritchie Pagunsan in the Drama: Kinaray-a Language category. The winners will receive a writing grant amounting to 250,000 pesos which will assist them during the writing stage of their projects. The writing grant is part of the NCCA's mission to directly foster the development and growth of Filipino literature. The NCCA Writers' Prize is staged every two years. What is the NCCA Writers' Prize?